If you know me at all, you know I am not a girly girl. Never have been. I have the most precious picture of me when I was about two in a red and white gingham dress and little blond pigtails...and skinned knees. I am that girl. The tree climber. The sports fan. The "I can get ready in 20 minutes including a shower" girl. 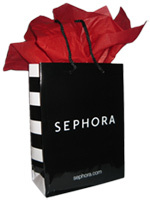 Author's Note: If I ever get to the letter S on my ABC's of Happiness post, I will for sure mention Sephora, but I just thought it needed its own post today. Aggghh! I hate that store! I feel so self conscious when I go in there! It is WAY too smart for me. I get my make up from Target or the old lady Lancome counter. Those Sephora girls are fierce! Yipes! I wonder if it lives up to the moniker?